I put a mic under the velux last night and woke to find a recording of screaming gulls and the first hours of a storm. Towards the end there's just a series of oddly rhythmic bumps and shuffles that made me wonder if I'd just subjected a sensitive mic to several hours of sustained abuse. The mic is fine though, so it could be the response of a fading battery, either way it made for interesting listening for Alex and me this morning while the next few gallons poured down onto the cottage. Between deluges we still had visitors. Some have become regulars. 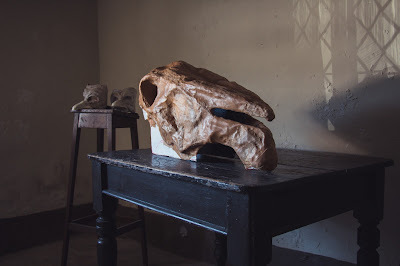 Others have been drawn by stories of renovation and a feel for period detail, or are curious about the open door into a childhood mystery. Ah yes, the 'oss. The 'oss has grown a jaw, and will soon be up and about on poles. Nine feet plus of occupied hollow, set to bend and sway under drapery and a winter sky. A KITCHEN OF DISTINCTION. LINDSAY, EMILY, IAIN, MARZIPAN. 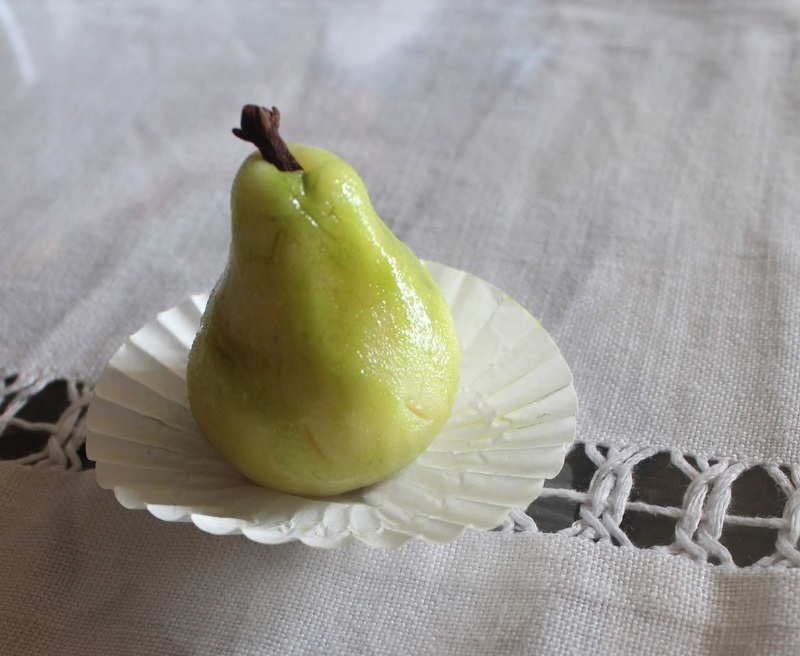 It's been a sunny day in Ulverston and the cottage was the best place to cool down, chat and make something sweet, colourful and nut-free if required with Lindsay Ward and her assistant Emily. Our neighbours brought flowers to brighten the room, Iain was on hand with the introductions and the local knowledge, and soon one half of the cottage was buzzing with talk about Sir John, the Ice Age, The Isle Of Man and the the Roman occupation while in the other half our visitors sat down with Lindsay and Emily and got to work..
We'll be in the cottage again on saturday (July 28th), this time with Alex. The plan is to walk his 9ft high 'obby' 'oss around the garden. 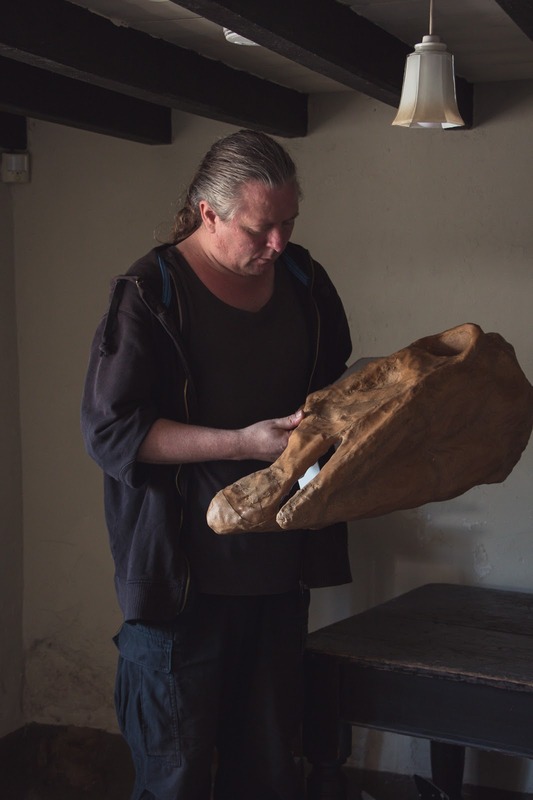 Iain will be on hand next thursday with his books, artefacts and arcane knowledge, and on August 11th, Ellie Chaney will be hosting a drawing session. So, plenty going on at The Sir John Barrow Cottage. 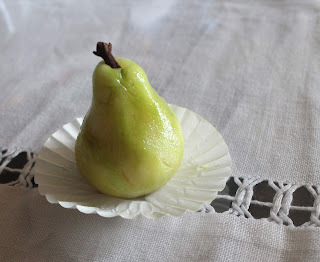 Luckily Emily provided a visitors comments book for today..
"an unexpected surprise for us to take part in some wonderful marzipan fruit decorating. Thank you." 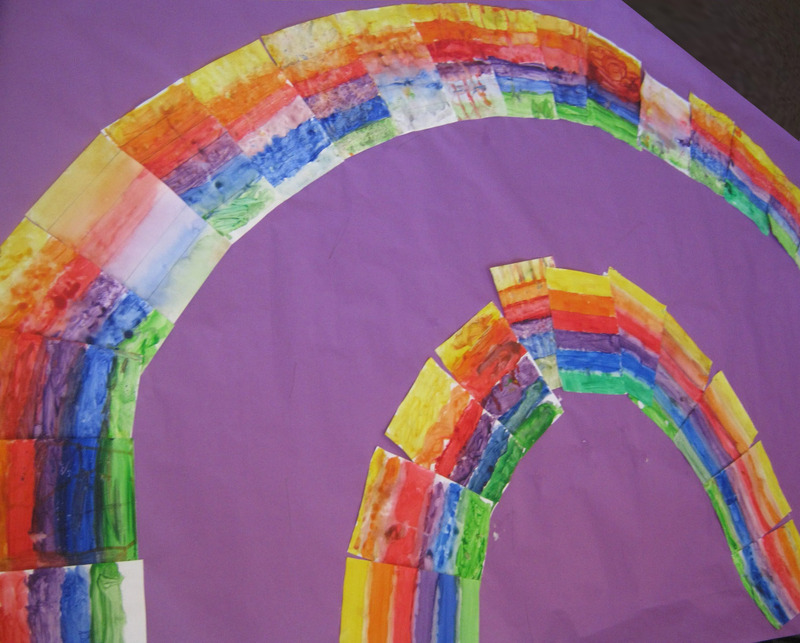 "...expert tuition from Emily Ward and Lindsay, Emily's mum." Many thanks to all who took part in Lexi's felting session today, and to Ulverston Library for hosting this and the exhibition of her work. 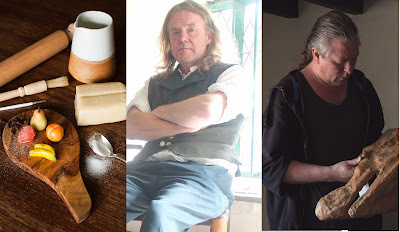 2 DAYS FOR THE DIARY..LINDSAY'S MARZIPAN SWEETIE KITCHEN, ALEX'S 'OSS AND YOUR GUIDE IAIN McNICOL. 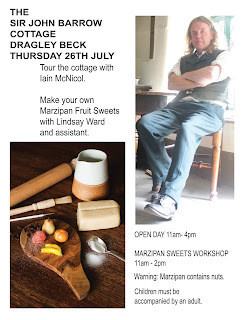 Lots of Ulverston people remember the Sir John Barrow Cottage as a sweet shop, and for one day only, on Thursday July 26th, it will be again. Kind of. 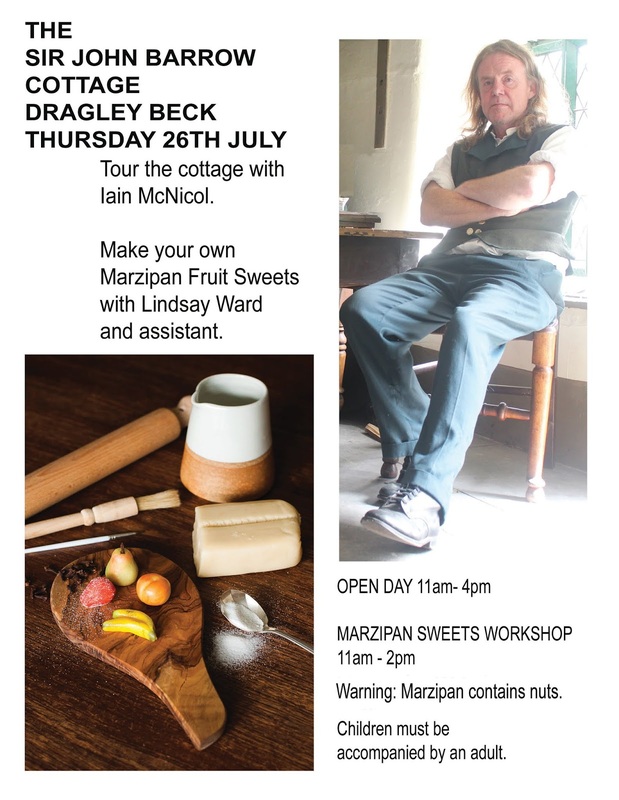 Lindsay Ward and her junior assistant will be running a Marzipan Fruit Sweets kitchen, where visitors will be able to make tiny sweets with marzipan and food colouring as part of our shared open day with Green Lane Archaeology and Historian Iain McNicol. 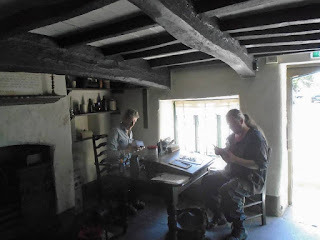 Iain opens the cottage to visitors every thursday. Last week a group of Year Three boys and girls from SJB school arrived, and Iain says some have made return visits, and acted as Guide to their little brothers and sisters. On Saturday July 28th John and Alex will be in the cottage, where you'll have a chance to see how Alex's 'obby 'oss is progressing. More on that to follow. Iain will be in the cottage on thursday from 11am till 4pm, and Lindsay will be on hand to make sweets with you from 11am till 2pm, for as long as stocks last. A warning though; marzipan contains nuts. 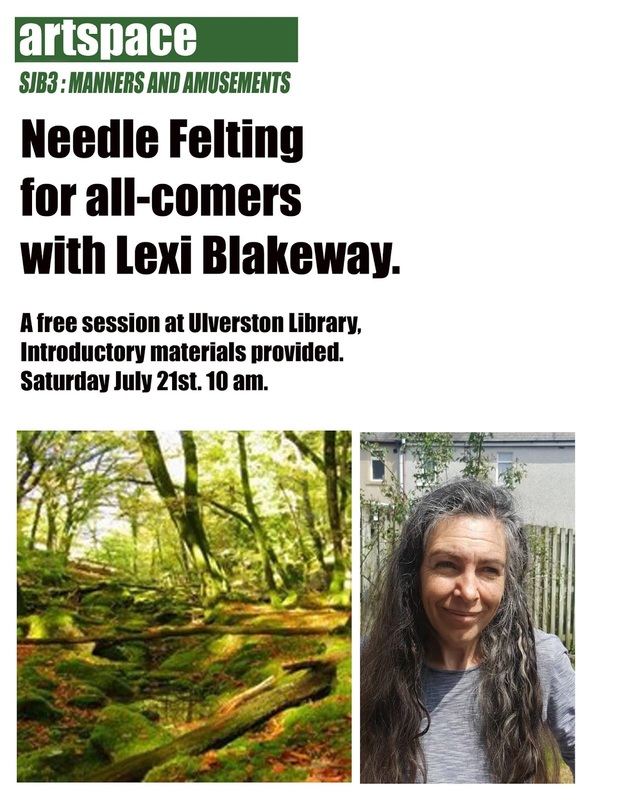 Alex and John will be on hand on saturday from 10 till 2. 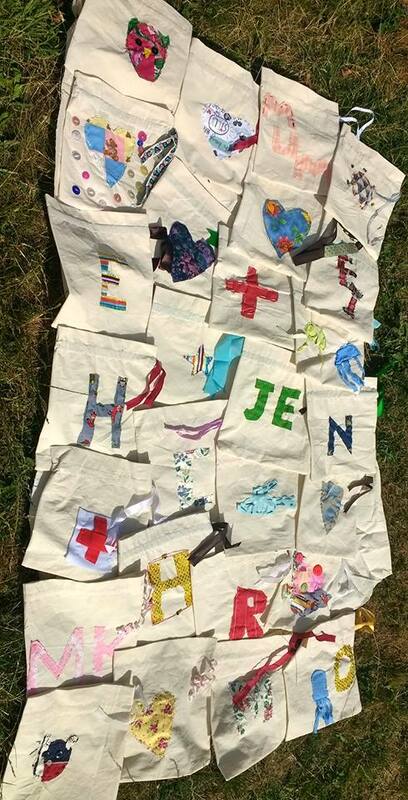 "A medley of bags from the Year 6 class I worked with at Sir John Barrow, what a fabulously creative and determined class they were." 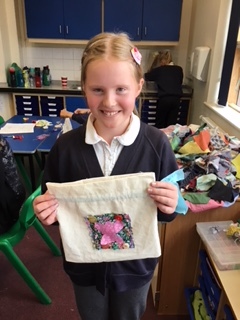 This is the last week at SJB and as Lexi's project ends we hear that the children will be loading up their new Drawstring Bags with souvenirs of their time in Year Six. I called in today to catch what was Lexi's final session, and the last of our whole programme. 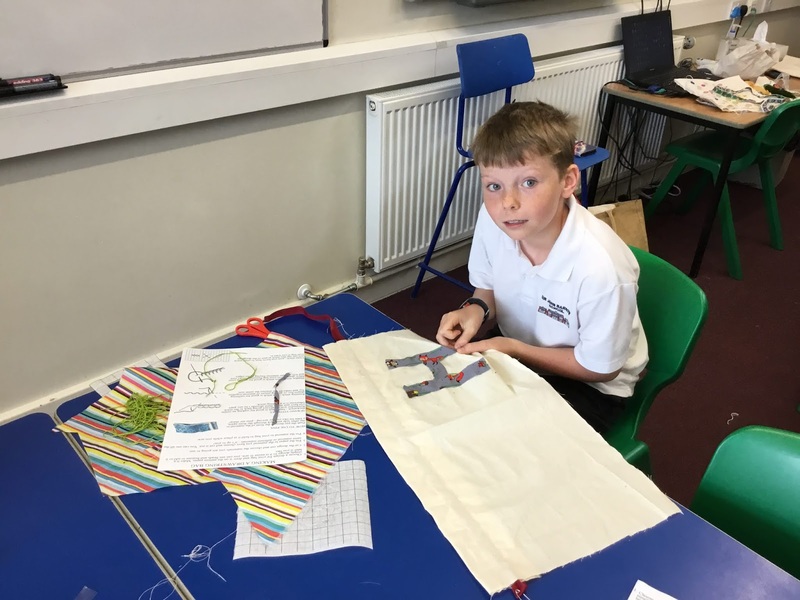 The plan was to demonstrate new skills that could be revisited and re-applied as the children progress through school, and to provide the school staff with some thorough and process-based lesson plans that can be used, re-used, adapted and re-adapted. 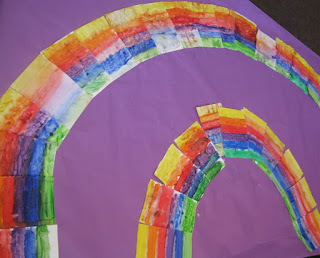 Alex, Lexi, Dominic and me have all enjoyed our time at SJB enormously. 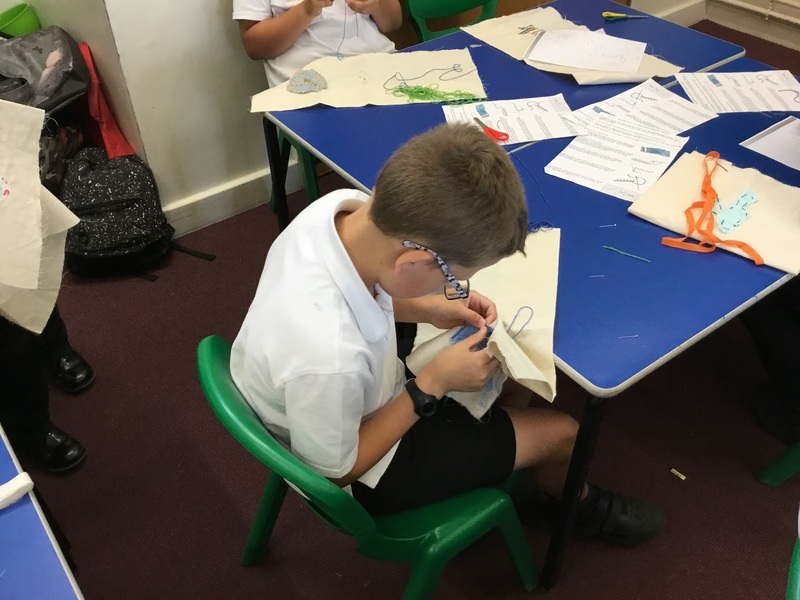 We all believe wholeheartedly in the value of the arts at all levels of education and we will do anything we can to support our local schools in their efforts to introduce and develop art and craft skills in our young people, along with the early signposting that might just set someone out there on a career path. We hope we can keep the relationship going; we will be meeting soon to discuss how it can be done. In the meantime, show off those bags, soon-to-be erstwhile Year Sixers, and get some use out of them. Lovely work. 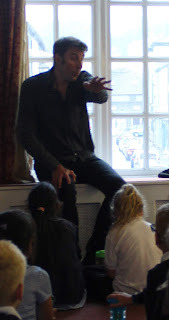 Dominic Kelly and the Year Three children have been working hard on their Stories and their Story-Telling techniques, and at 10.30 on Saturday morning this weekend they will be in the Supper Room at Coronation Hall as part of the Furness Tradition Folk Festival, sharing the bill with internationally renowned musicians, dancers and other storytellers...including Dominic himself who will be performing in the afternoon. We are also happy to be able to pay for two tickets to our show for the families of each of the children who are performing. If that's you, the school will be getting in touch. The festival is in its 2Oth year now, and it's one of the highlights of the year...we are all very proud to be involved. Here's the festival website, where you can find full details of the weekend programme..
"Over recent weeks the children have been storyboarding their tales and this last week we’ve opened up a little toolbox of techniques for bringing the storytelling to life in front of an audience: how to go in and out of characters, play with the speed and volume of their telling, and use their physicality to make it even more fun. The children have divided into groups and each group has decided for themselves how they would like to split the storytelling between themselves. 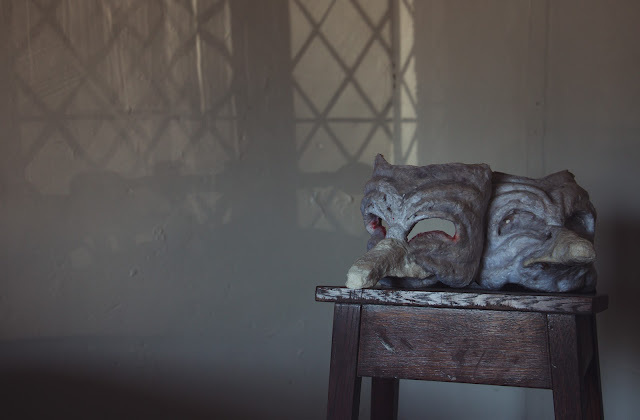 They’ve been rehearsing - and also filming to evaluate how their own storytelling performance is progressing. On Friday we’ll have a last rehearsal in the Supper Room of the Coronation Hall, where the groups will get used to how we’ll run our ‘storyfair’ event the next day. And then on Saturday morning they’ll be performing their stories in front of live audiences for the first time!" Exciting business....we shall see you there. 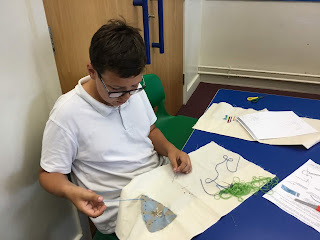 Ms Davison and their supporters would move around the room offering advice and help on cutting patterns and fixing the children's designs to their bags. The work looks lovely; we have the personalised needle books with their combinations of stitchcraft, beadwork, colour and surface and now the bags are on their way, with motifs ranging from initials, hearts, a pair of octopus and a few World Cup inspired combinations of red and white. This isn't an easy process, and as we've said elsewhere during these sessions, if the process isn't followed then the work won't hold up. These children understand that, and are combining important crafting skills with decisions on colour and texture and applying them to a practical end. in what they were doing and at what they had produced. All were engaged, sure of getting help when they needed it, all getting the time to work through the process and find pleasure in it.